Tolerances: Inch ±.010, Metric ±.25mm unless specified otherwiese. 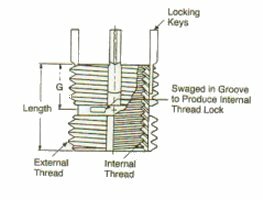 Keys: Inserts with internal thread size of 5/16-18 or larger are furnished with four locking keys. Smaller sizes have two locking keys.